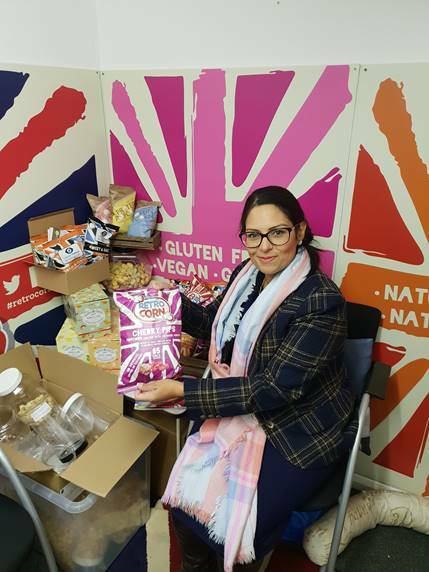 Witham MP, Priti Patel, popped into Retrocorn today, a Witham based popcorn business. Managing Director, Greg Taylor, set up the confectionary business in his grandmother’s kitchen five years ago and it is a real local success story. Greg is celebrating securing Retrocorn’s first UK supermarket contract with Ocado and has big plans for the future growth of his business. Retrocorn’s exciting and innovative popcorn flavours include rhubarb and custard, strawberries and cream, cola cube and lemon and lime. “It was a pleasure to visit the Retrocorn factory in Witham today and I am delighted to see this outstanding local business go from strength to strength. Retrocorn is a clear example of the entrepreneurial spirit we have here in Essex and a model for local budding entrepreneurs.